Carlos Rosa speaks about the importance of neighborhood relationships. Rosa, a community organizer running for alderman, spoke Thursday at the Sheil Catholic Center. 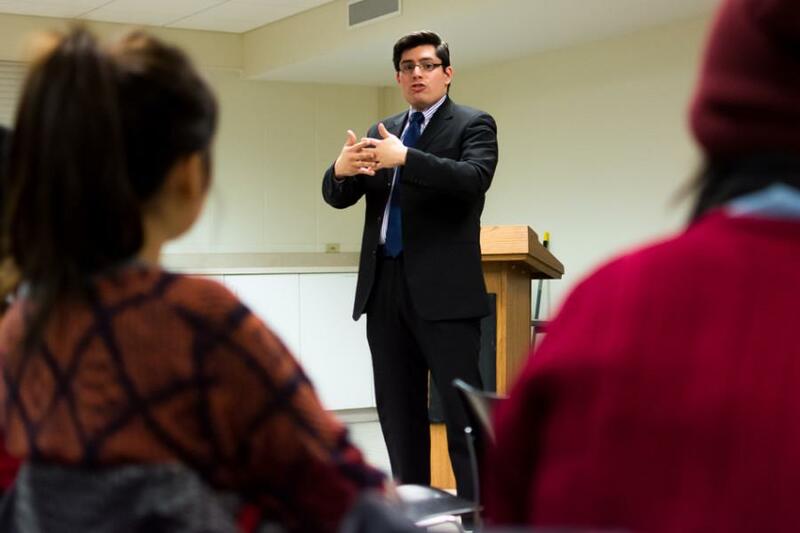 Carlos Ramirez-Rosa, candidate for alderman in Chicago, spoke about social justice Thursday at a teach-in on campus. About 30 students attended the event at the Sheil Catholic Center. Students spoke in an open forum about political issues in the greater Chicago area, which was followed by a question-and-answer session with Rosa. The 26-year-old community organizer is currently the only challenger to incumbent Ald. Rey Colon (35th) in the alderman race for the 35th ward, which includes Logan Square. At the event, Rosa promoted a progressive agenda, including raising minimum wage, promoting restorative justice and increasing funding for public education. “In the last 10 years we’ve seen 10,000 Latino families forced out of the 35th ward,” Rosa said, when asked why he entered the race. “In the 35th ward, we see people being pushed out of their neighborhoods, we see increasingly how Chicago is not a place for working families. Emiliano Vera, a SESP junior who organized the event, said he invited Rosa to speak about how people can get involved in social justice activities and racial and economic justice. “I know that people are either frustrated that there isn’t enough opportunity for meaningful involvement or that the opportunities that are there are more or less venting that’s not productive,” he said. Vera was one of several students who gave remarks prior to Rosa’s arrival. While others discussed Chicago’s political history and emphasized the importance of fighting corporate greed, Vera instead shared his own personal interest in politics. While he is the first openly gay Latino candidate for a Chicago alderman position, Rosa doesn’t think this fact will have a bearing on his bid. “To be honest, because I think that because of the grassroots movement of the LGBT movement, we’re at a point in time where people don’t really care anymore, but that took a lot, a lot, of work,” Rosa said. Rosa is endorsed by Reclaim Chicago, a political action committee whose goals include reducing corporate power and promoting equality, according to its website. The organization endorsed Rosa for his community organizer mentality and his ability to organize people to be politically active, Reclaim Chicago spokeswoman Kristi Sanford told The Daily before the event. Rosa was a former congressional caseworker for high-profile Latino leader Rep. Luis Gutierrez (D-Ill.). Gutierrez was recently announced as co-chairman of Chicago Mayor Rahm Emanuel’s reelection campaign. Rosa opposes Emanuel for his policies and his corporate relationships. Rosa voiced his support for fellow progressive Jesus “Chuy” Garcia for mayor. Grace Pai, a field organizer for Reclaim Chicago who attended the event, said she supports Rosa for his vision of putting zoning and development plans back into the hands of constituents. One of Reclaim Chicago’s goals is to “get corrupted and entrenched politicians out of office,” she said. “I’m involved in this because this is personal to me, and the only way to make change is to change the system,” Vera said.